Experience authentic Broome at the historic Roebuck Bay Hotel! Fun and affordable, Broome’s longest standing hospitality establishment was built in 1890 to entertain the pearling crews and many of the pioneering workers of the day, something that the hotel continues to proudly do. Located in the heart of Broome with Chinatown, stunning pearl shops, art galleries, restaurants, boutiques, books stores and much more all within walking distance - there is not a more convenient place to stay. The Roey is just a 5-minute drive to the glorious Cable Beach or guests can choose to relax around the palm-fringed swimming pool on the property. Known as the ‘The Roey’, the hotel is a one-stop for all your holiday needs; good quality accommodation; restaurants, bars and great live music year round in comfortable indoor and outdoor areas. The Roey also boasts Broome’s only nightclub – Skylla. The Oasis Bar at The Roey is one of Broome’s best live music venues having hosted sell-out concerts of Paul Kelly, The Waifs, The Angels and many legendary Australian bands. The hotel accommodation is clean and comfortable and each room has its own ensuite bathroom, TV, tea and coffee facilities and is serviced daily. The Roey Backpackers is fun and great value for money with a BBQ area, kitchen setup, TV lounge, great bathroom facilities and a range of different room choices. Backpacker dorm rate is for one bed per person only. Guest must be over 18 to stay in the backpacker hostel. Rate includes free entry to Oasis and Bungalow bar nightclubs on our regular nights. 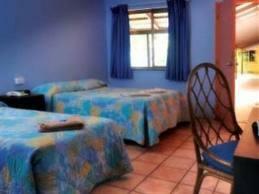 Our rooms come in configurations of 4, 8 and 12 bed dorms, and we have mixed rooms or just male or female. Please advise your preference when making a booking. A $50 deposit must be paid on arrival, this includes your lines, cutlery and all utensils. Deposit returned upon departure and return of all goods. 1 double bed and 1 single bed. All rooms have tea & coffee making facilities, mini fridges, ensuite & air conditioning. **Please be advised children allowed, cots are available for infants under 2 years of age free of charge. **If more than 3 people in one room a $25 charge per person per night will apply. 1 double bed and 1 bunk bed (2 singles). All rooms have tea & coffee making facilities, mini fridges, ensuite & air conditioning. **Please be advised children allowed, cots are available free of charge for infants under two years old. **If more than 3 people in one room a $25 charge per person per night will apply. 1 queen bed & 1 single bed. Tea & coffee making facilities, mini fridge and full bathroom. Fans as well as air conditioning. 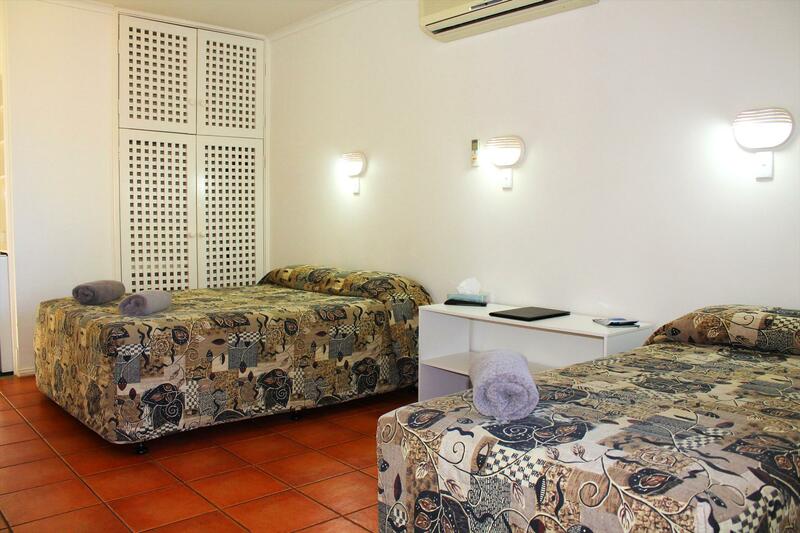 Superior Rooms are larger rooms, either upstairs or downstairs and overlooking tropical pool area. **Please be advised children allowed, cots are available free of charge for infants under two years old. **If more than 3 people in one room a $25 charge per person per night will apply. Cancellations made within 24 hours or less the fee of 1 night’s accommodation will be charged and the balance refunded.